Mary Meigs was an American-born painter, sculptor and writer. She served in the U.S. Navy’s WAVES corps during World War II. She studied art in New York City and had her first exhibition of paintings in 1950. With Barbara Deming, whom she met in 1954, she moved to Cape Cod and joined an artistic circle that included abstract painter Mark Rothko, critic Edmund Wilson, and writer Mary McCarthy. In 1963 Wilson introduced Meigs to Marie-Claire Blais, a writer from Quebec who became romantically involved with Meigs and Deming. Meigs and Blais moved to Brittany and then both returned to Montreal in 1976, where Meigs spent the remainder of her life. She began her writing career at age sixty. She was the author of six books-- Lily Briscoe: A Self-Portrait , The Medusa Head , The Box Closet , The Company of Strangers , The Time Being and Beyond Recall (all available from Talonbooks). All of her books were semi-autobiographical, and all of them were formally quirky and original. Meigs was hailed in Geist magazine as "one of the great prose writers of our time." The Boston Sunday Globe called her writing "exquisitely attuned to the interplay between art and life." 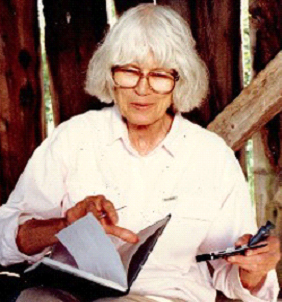 In addition to her writing, Meigs became a prominent spokesperson in Canada for lesbian, feminist and seniors’ issues. Meigs acquired a degree of celebrity in 1990 after appearing-- and coming out--in Cynthia Scott's semi-documentary film "The Company of Strangers." The award-winning In the Company of Strangers is her account of that experience. Meigs suffered a stroke in 1999. Beyond Recall (2005), a collection of her post-stroke writings, compiled and edited after her death by Lise Weil, was a finalist for a Lambda Literary Award. Meigs died in Montreal in 2002, following a series of strokes. A longtime financial supporter of the Barbara Deming Memorial Fund, Inc. she left the fund an annuity which continues until 2017.